John’s Gospel tells us that near the crucifixion site was a garden. The Greek word for “garden” is kepos, and it refers to any garden with trees and spices. It can also be translated as an orchard. The same word is used in John 18:1 to describe the Garden of Gethsemane, which was an olive tree orchard. All four Gospels suggest that this tomb was near the place where Jesus was crucified, but John 19:42 says, “…The sepulchre was nigh at hand.” The word “nigh” is the Greek word aggus, meaning nearby. Most crucifixions were performed along a roadside. Evidently this garden was located in an orchard-like place, just down the road from where Jesus was crucified. Matthew, Mark, and Luke all record that this tomb belonged to Joseph of Arimathea, suggesting that it was the tomb he had prepared for his own burial. The fact that it was a tomb “hewn out in the rock” (Matthew 27:60; Mark 15:46; Luke 23:53) confirms the personal wealth of Joseph of Arimathea. Only royalty or wealthy individuals could afford to have their tombs carved out of a wall of stone or in the side of a mountain. Poorer men were buried in simple graves. The word “hewn” in Matthew, Mark, and Luke comes from the Greek word laxeuo, meaning not only to cut out, but to polish. It implies that it was a special tomb, a highly developed tomb, a refined tomb, or a tomb that was splendid and expensive. Isaiah 53:9 had prophesied that the Messiah would be buried in a rich man’s tomb, and the word laxeuo strongly suggests that this was indeed the expensive tomb of a very rich man. John 19:42 says, “There laid they Jesus….” The word “laid” comes from the word tithimi, which means to set, to lay, to place, to deposit, or to set in place. As used here, it portrays the careful and thoughtful placing of Jesus’ body in its resting place inside the tomb. Luke 23:55 tells us that after Jesus’ body was placed in the tomb, the women who came with Him from Galilee “…beheld the sepulchre, and how his body was laid.” The word “beheld” in Greek is theaomai, from which we get the word theater. The word theaomai means to gaze upon, to fully see, or to look at intently. This is very important, for it proves the women inspected the tomb, gazing upon the dead body of Jesus to see that it had been honorably laid in place. Mark 15:47 identifies these women as Mary Magdalene and Mary the mother of Joses and says that these women “…beheld where he was laid” at the tomb. The imperfect tense is used in Mark’s account, alerting us to the fact that these women took their time in making sure Jesus was properly laid there. It could be translated, “they carefully contemplated where he was laid.” If Jesus had still been alive, those who buried Him would have known it, for they spent substantial time preparing His body for burial. Then after His dead body was deposited into the tomb, they lingered there, checking once again to see that the body was treated with the greatest love and attention. Once they were certain everything was done correctly, Joseph of Arimathea “…rolled a great stone to the door of the sepulchre, and departed” (Matthew 27:60; Mark 15:46). It was rare to find a stone entrance to a Jewish tomb in biblical times; most Jewish tombs had doors with certain types of hinges. A large stone rolled before the tomb would be much more difficult to move, making the burial site more permanent. However, the chief priests and Pharisees weren’t so sure that the site was secure. Fearing that Jesus’ disciples would come to steal the body and claim that Jesus had been resurrected, the Jewish leaders came to Pilate and said, “…Sir, we remember that that deceiver said, while he was yet alive, After three days I will rise again. Command therefore that the sepulchre be made sure until the third day, lest his disciples come by night, and steal him away, and say unto the people, He is risen from the dead: so the last error shall be worse than the first” (Matthew 27:63,64). When the chief priests and Pharisees asked that “…the sepulchre be made sure…,” the Greek word sphragidzo is used. This word described a legal seal that was placed on documents, letters, possessions, or, in this case, a tomb. Its purpose was to authenticate that the sealed item had been properly inspected before sealing and that all the contents were in order. Aslong as the seal remained unbroken, it guaranteed that the contents inside were safe and sound. In this case, the word sphragidzo is used to signify the sealing of the tomb. In all probability, it was a string that was stretched across the stone at the entrance of the tomb, which was then sealed on both sides by Pilate’s legal authorities. Before sealing the tomb, however, these authorities were first required to inspect the inside of the tomb to see that the body of Jesus was in its place. After guaranteeing that the corpse was where it was supposed to be, they rolled the stone back in place and then sealed it with the official seal of the governor of Rome. Matthew 27:66 says, “So they went, and made the sepulchre sure, sealing the stone, and setting a watch.” Wasting no time, the chief priests and elders hastened to the tomb with their government-issued soldiers and the special officers assigned to inspect the tomb before placing Pilate’s seal upon it. After a full inspection had been made, the stone was put back in place, and the soldiers stood guard to protect the tomb from anyone who would attempt to touch it or remove its contents. Every three hours, new guards arrived to replace the old ones. These armed soldiers guarded the entrance to Jesus’ tomb so firmly that no one would have been able to come near it. The purpose of the seal was to authenticate that Jesus was dead; therefore, we can know that His body was thoroughly inspected again for proof of death. 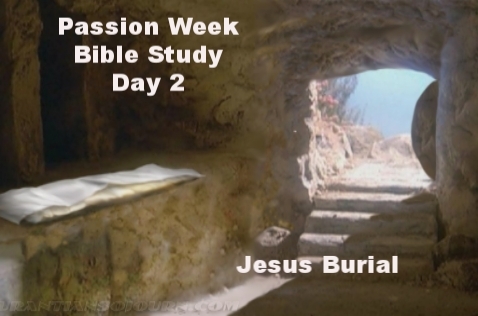 There is no doubt that Jesus was dead, for He was examined again and again, even as He lay in the tomb. Some critics have claimed that only Jesus’ own disciples inspected His body and that they could have lied about His being dead. However, an officer from Pilate’s court also examined the body of Jesus. We can also be fairly certain that the chief priests and elders who accompanied the soldiers to the burial site demanded the right to view His dead body as well so they could verify that He was truly dead. This word from the cross teaches some wonderful truths. It illustrates that the way of salvation is wondrously simple. The devil has blinded the eyes of men and women to thinking that it is hard to be saved, difficult to come to Christ and to become a Christian. But this clearly isn’t true. The man was saved simply by asking the Lord to save him. In the words of his request, there’s the implication that he felt and confessed his need of salvation; he believed the Lord could and would save him and he committed himself to the Lord and trusted him to save him (Romans 10:13).